This collection of 35 Celtic tunes represents ten different performance styles from Ireland, Scotland, Wales and Brittany. The majority of these pieces are dance tunes such as the jigs and reels popular at Irish sessions, the informal gatherings of musicians in pubs, community halls, and homes. 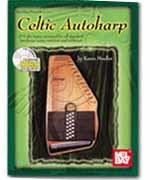 Although relatively new to the session ensemble, the autoharp bears a distinct resemblance to the Irish folk harp. Fittingly, this collection includes harp tunes by famed Irish harpist Turlough O'Carolan as well as other slow airs. All of the pieces in this book have been arranged to be played on any standard 15 or 21-bar chromatic autoharp in either melodic or rhythmic (backup) style. A melody line with suggested chord accompaniment is included so other instrumentalists can easily join in. The book's companion CD includes performances of all 35 selections, ably illustrating the rhythmic and stylistic nuances of this engaging music. In notation and tablature.